Jack: Okay, what are your terms? Miguel: Our terms are: you lose and we win. The whole world knows you beat us all. We are worth nothing now. Amid a chaotic frenzy of bullets and mayhem, Jack (Taiwanese rock star Wu Bai) attempts to escape the wrath a group of trained mercenaries. After a breathless car chase around a parking garage, he leaps out of the car and tumbles over the side of the steep building. Luckily, Jack has wrapped himself with a tight hose to break his fall. Hanging still far from safety on the ground, he executes a daring horizontal swinging move onto the freeway and survives his unflinching pursuers. This is just one example of numerous remarkable action scenes in Tsui Hark's Time and Tide—a stylish, exciting ride through the streets of Hong Kong. The story focuses on the efforts of Jack and young Tyler (Cantonese pop star Nicholas Tse) to create a better life for their pregnant female counterparts. Jack has a shady past as a member of The Angels—a group of vicious killers lead by Miguel (Joventino Couto Remotigue). Following a hastily explained rift between Jack and his buddies, he's fled to Hong Kong with his wife Ah Hui (Candy Lo) to make a different life for their child. Unfortunately, The Angels have arrived in the area and won't allow him to depart so easily. In a drug-induced hazy night, Tyler awakes to find himself in bed with lesbian cop Ah Jo (Cathy Tsui), and she becomes pregnant as a result. Although she adamantly rejects his assistance, he works as a bodyguard for Uncle Ji (Anthony Wong) in order to make money for her. This basic structure paves the way for a series of complex action sequences executed with style and efficient grace. Jack's problems with his former associates are not entirely clear, but Tsui Hark (Once Upon a Time in China ) isn't too interested with the specific elements of the plot, Instead, he utilizes these conventions to create a modern, entertaining thriller. The structure allows for an intriguing study of methods for character revelation within a tightly edited story. In the beginning, we're aligned with Tyler's efforts to break through to Ah Jo and gain a valuable place in Uncle Ji's group. Still a fairly young man at 21, he carries a boyish enthusiasm for his work that's missing from Ji's stern countenance. Once the plot appears fairly understandable, the script switches gears and focuses on the conflict between Jack and The Angels. Tyler remains involved in the events, but he moves toward the fringes of the action. The second half of the film is a lengthy and virtually unstoppable action sequence that moves from a claustrophobic apartment complex to the open space of a stadium. Considering the amount of activity that occurs, it's amazing that Hark and co-writer Hui Koan are able to generate a large amount of compassion for the main characters. The supporting characters also become surprisingly believable within a limited amount of screen time. Miguel is especially effective as a cold-hearted, fun-loving killer with a keen interest in toying with cockroaches. Although the characters come across nicely, the obvious drawing point of this film is the series of breathtaking gun battles. In one early scene, The Angels prove their mettle by dismantling a small army with quick and deadly precision. The highlight is an often-used standoff, which involves two individuals pointing guns at each other's head. This fatal result differs dramatically from the usual clich� and presents one example of the originality of this movie. Tsui Hark utilizes a diverse collection of tactics to keep the scenes from becoming the typical dull shoot-'em-up scenes. The camera often covers a moment within just one shot or moves in a creative direction within the mayhem. He also completely halts the action at times to emphasize an explosion or specific movement. The premier sequence occurs at the apartment complex, a series of run-down high rise buildings with a courtyard in the middle. With his enemies perched at strategic locations throughout the site, Jack must negotiate the stairwells and narrow hallways with perfect skill to remain alive. In this era of such dull big-budget blockbusters as Pearl Harbor, Tomb Raider, and The Mummy Returns, special effects have begun to overtake the need for true creativity and innovative direction. Time and Tide stands as a true summer action film in the sense that it incorporates fun and excitement into an action-packed story. Also, realistic characters are not sacrificed within the enjoyable sequences. Tsui Hark has made his share of clunkers over the years, including the Jean Claude Van Damme movies Double Team and Knock Off. With this entry, however, he has re-invigorated the genre with style and flair, and the result is pure entertainment. Image Transfer Review: Time and Tide's 2.35:1 anamorphic widescreen transfer features moments of sparkling clarity that rank among the top DVD releases. In a few instances, however, a surprising amount of grain and haziness exists on the screen that lowers its effectiveness several notches. The camera is almost constantly active and moving throughout the chaos of the gun battles, and a few scenes fall short in terms of picture quality. Overall, this frenetic film operates nicely on this transfer and retains the exciting atmosphere conveyed on the big screen. Audio Transfer Review: The 5.1-channel Dolby Digital transfer on this disc contains possibly one of the best examples of the proper use of surround speakers on any recent release. The balance settles nearly perfectly throughout the sound field, and the extra touches spring wonderfully from the background. Offered in both the original Cantonese and a dubbed English track, these digital transfers present the action scenes in all their glory. However, they truly shine during the quiet moments before the fury, as birds flap around and individuals prepare for trouble. This release also offers 2.0-channel Dolby Surround tracks in both Cantonese and English that present the gunfights in fine form. However, they lack the extra complexity that really carries the superior digital transfers. Extras Review: The only notable supplement is an informative feature-length commentary with director and co-writer Tsui Hark. Instead of following the frustrating plot summary often included on tracks for action films, he discusses his thoughts about each character and their motivations. While some of the material drags at times, it does contain some intriguing background and tidbits about the story. Hark actually tried to make the fight scenes more realistic and less polished than the strict choreographed action of his counterparts. His tone is straightforward and down-to-earth, which makes the commentary accessible and easy-to-follow. The remaining extra features are pretty light in terms of substance or interest. 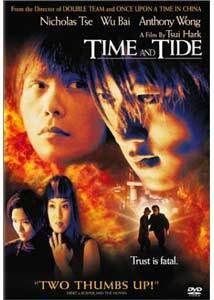 There are filmographies for Hark and Nicholas Tse, and trailers for Time and Tide and several related pictures. The three bonus previews come in full-frame transfers, with the worst being the poor picture for Once Upon a Time in China. During its brief American theatrical release in May, Time and Tide barely registered a blip on the radar within the marketing juggernauts of the Hollywood summer season. Its DVD release is the perfect time for legions of viewers to discover the wonders of this enjoyable, over-the-top film. Chinese filmmaker Tsui Hark has injected plenty of style and power into creative, extensive sequences of frantic gun battles, while managing to slip some emotional weight and realism into the cracks.